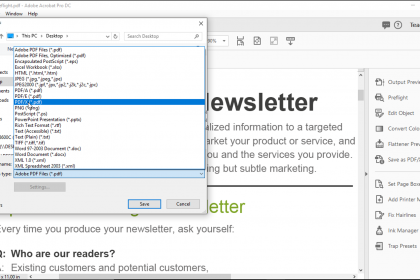 You can create a standards-compliant PDF in Acrobat. The most-common reason for doing this is that the document must comply with ISO 32000 standards. Depending on the intent for using the PDF, compliance standards vary. You can save a document as a PDF/A, PDF/E, or PDF/X file. You use PDF/A files for archival purposes. They provide specifications for creating, viewing, and printing documents you intend to preserve over a long period of time. PDF/A documents are saved as self-contained files and no references to outside files are preserved with this format. You use PDF/E files for engineering purposes. They are most commonly used by architects, construction teams, and manufacturing professionals. The PDF/E format allows for the inclusion of interactive media, such as animation and 3D rendering. You use PDF/X files for print production. The PDF/X format provides guidelines for settings that are crucial to print production, such as color space. PDF/X files also restrict multimedia content and other content that does not relate to professional print production. To create a standards-compliant PDF in Acrobat, open the document in Acrobat. Then choose “File| Save As…” from the Menu Bar to open the “Save As PDF” dialog box. After naming the file, then use the “Save as type” drop-down to select the standards-compliant file type for the PDF (PDF/A, PDF/E, or PDF/X). After making your selection, then click the “Save” button to finish. 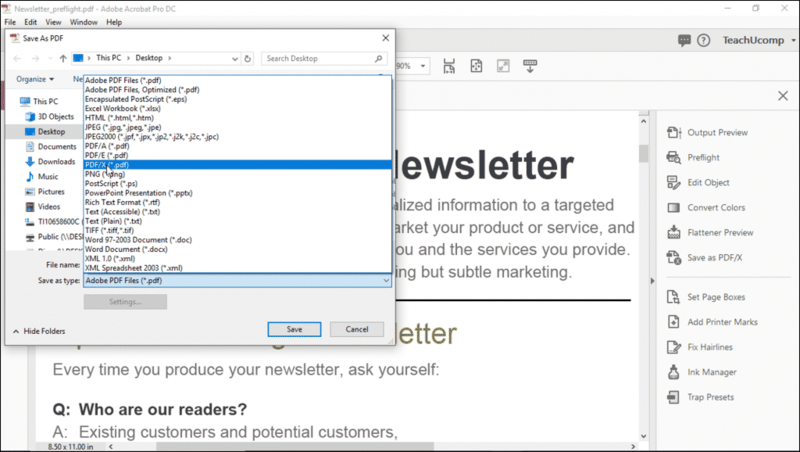 Create a Standards-Compliant PDF in Acrobat – Instructions: A picture of a user saving a document as a PDF/X file in Acrobat. To create a standards-compliant PDF in Acrobat, open the document in Acrobat. Then choose “File| Save As…” from the Menu Bar to open the “Save As PDF” dialog box. After naming the file, then use the “Save as type” drop-down menu to select the standards-compliant file type for the PDF (PDF/A, PDF/E, or PDF/X). After making your selection, then click the “Save” button to finish. Sale! $15 Courses! 0 Days 18 Hours 43 Minutes 44 Seconds $50 $15 Every course on sale!